Fig. 6.53 a Low cheek rotation combined with an Estlander flap. Fig. 6.54 Vermilion advancement of Goldstein (1984). a The vermilion is incised through all three layers along the skin-vermilion border, preserving its attachment to the labial artery. b The flap is advanced over the defect and sutured into place. ternal defects can be covered by two-layer advancement of the overlying and underlying soft tissues. A particularly effective technique is Esser's cheek rotation (Fig. 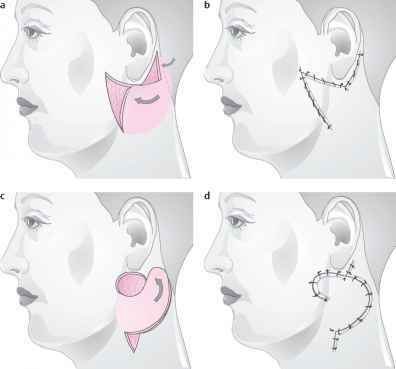 6.52a) combined with the advancement of buccal and mental soft tissues by making an incision inferomedial to the defect and into the chin and excising Burow's triangles. An attempt should be made to place the resulting scars in the RSTLs (Fig. 6.52b). Microvascular free flaps are also an option in selected cases. Very large defects are covered with mucocutaneous island flaps (see Figs. 12.1 and 12.2) or free grafts (see Fig. 14.1).